Uptown Pike Plan: Should it Stay or Should it Go Now? 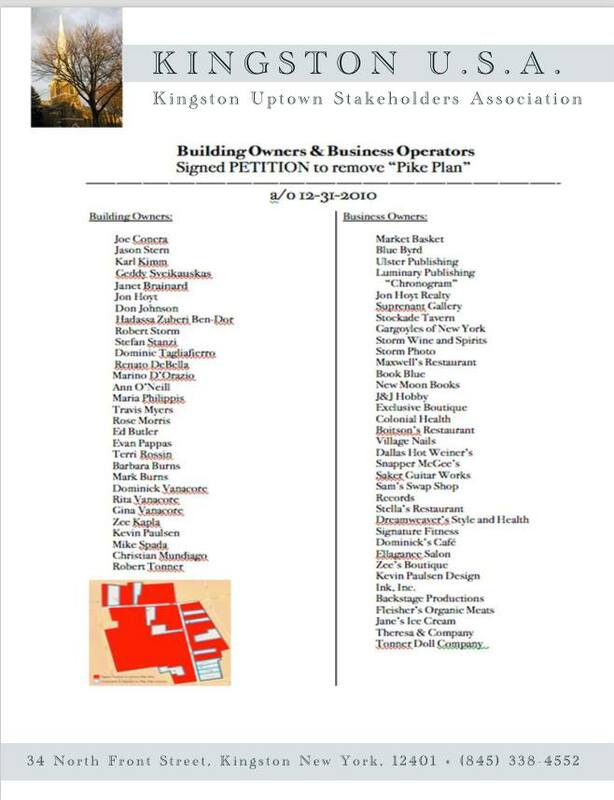 An image from a 2010 petition where 90% of the building owners on Wall and North Front Streets in Uptown, Kingston were in favor of removing the Pike Plan. For those who were not around during the most recent renovation of the Pike Plan (2008 – 2011 -ish), I recall the following article written by Steve Hopkins who at the time was the current (or outgoing) editor of the Kingston Times. He did a great job capturing the essence of the feeling then. With the Pike Plan being discussed by the council and, a recent Kingston Times poll, it seems like a good time to share some of the information we have from back then to provide some historical context. POLL: SHOULD THE CANOPIES IN UPTOWN KINGSTON BE TAKEN DOWN? Given what it would cost to fix the rehabbed Pike Plan – only a decade old and in many places already falling apart- and the costs of removing the canopies for the buildings and streetscapes to be restored to their original glory – I personally hope that the city will find its way to the latter. Thanks to Steve Hopkins for allowing us to repost his article here. But by the time you read this article, a group of insurgents may have succeeded in throwing a legal monkey wrench into the wheels of the “unstoppable” juggernaut. The litigation, under consideration by a growing and increasingly vocal band of disgruntled property owners headed (reluctantly, he says) by Wall Street real estate broker Jon Hoyt, would target the Pike Plan Commission itself as being, in its current incarnation, illegal under the city’s municipal code — therefore rendering it at least temporarily powerless to impose the project as well as unauthorized to have taken out a controversial $100,000 bond it floated in the owners’ names to jumpstart the process. The “Pike Plan,” for those unfamiliar with Kingston esoterica, was named for a now-obscure watercolorist named John Pike, a mainstream painter with a long, odd history of commercial and military work before settling in Woodstock in the 1960s to teach his successful proto-realism technique to budding commercial artists referred to him by ad agencies and corporations. While living in Jamaica in the ’30s, he painted murals, did advertising for the rum industry and designed stores, nightclubs, and theaters (in Kingston, Jamaica!) in the signature Euro-Caribbean plantation-influenced style that would later show up to keep shoppers’ heads dry in Kingston, NY. Trained as a military pilot, he served in the Psychological Warfare Branch of the U.S. Army in Egypt and Italy, doing God knows what until he was shipped off to the Philippines, where he headed a unit of the Combat Art Section of the U.S. Army Corps of Engineers, which someone thought necessary to bring in to record the American occupation of Korea in 1945. Those paintings are reportedly still being maintained somewhere in the bowels of the Historical Properties Section of the Defense Department. But calling his eponymous Pike Plan “historic,” in the sense of requiring the excruciating and expensive restoration of every rotten, worm-eaten timber in its shoddily-built fake façade, is a stretch. From the canopy supporters’ point of view, it’s about the money, which is the true driver of this train. The renovation plan, although put into motion and shepherded by the seven-member Pike Plan Commission, is being funded by the usual inedible bouillabaisse of federal, state and borrowed money, headed by $860,000 in earmarks painfully extracted from the federal government by an increasingly exasperated U.S. Rep. Maurice Hinchey, whose contribution has been held captive by this long, drawn-out process since 2006. The proposed project languished in limbo for a year or two as a preliminary study performed by urban designer and “Main Street” marketing guru Norman Mintz (who famously said that the canopy should be taken down until he was shushed by city officials and preservationists) failed to provide the necessary impetus to spend the money on the big fix. Even now, as timelines are being drawn, little is known about just how much “renovation” will need to be done to implement the designers’ vision, which includes skylights and possibly a more open and sustainable support system than the rotting columns barely holding the thing up today. Bidding has not even begun on the project, and building owners are understandably pointed in their criticism of the Pike Plan Commission’s unwillingness to plan for the event of serious cost overruns, a distinct possibility judging from the massive can of worms — or termites, more likely — hiding behind the thin fascia of the 13,000-square-foot wooden structure. The project is being designed under the aegis of a NYC consulting firm with a wider role in the efforts to re-imagine Kingston: The RBA Group, which is under contract to the city to implement its Uptown Stockade Area Transportation Plan in conjunction with a bewildering array of public planners and quasi-public agencies. The mayor’s economic development director, Steve Finkle, is involved, as are Ulster County Planning director Dennis Doyle and Rural Ulster Preservation Company (RUPCO) executive director Kevin O’Connor, as well as representatives from Scenic Hudson and the Kingston Uptown Business Association (KUBA). All of them want to see the money spent and the myriad projects concerning Uptown revitalization and transportation tinkering completed, if only in some of their minds to ensure that Kingston doesn’t screw up the possibility of getting even more money, especially given the current loosey-goosey stimulus package climate. Further confusing the chain of command, RBA is abetted in the Pike Plan portion of its work by a small consortium of subcontracted local architects that includes Brad Will of Ashokan Architecture and Robert Young, a Pike Plan Commission member who since he got the job has recused himself from participating in votes and meetings pertaining to the project. What exists of the Pike Plan Commission held court at 9 a.m. on Tuesday, April 7 in the Wall Street storefront of Backstage Studio Productions, owned by Teri Rossin, one of the more vocal opponents of the canopy renovation. Among the commissioners at the table facing a glowering group of building owners sat the beleaguered Hoffay, Dream Weavers business owner Dominick Vanacore, the lone project critic on the commission he in fact chairs; Carter Hastings, the canopy project’s main champion among building owners; and Suzanne Cahill, director of the City of Kingston Planning Department. Among the owners present, Jon Hoyt did most of the talking, at times going almost mano-a-mano with Hoffay. Of great interest to this observer was the attention paid among the insurgent contingent to remarking on who wasn’t there, including the Godot-like figure of Mike Spada, who owns one of the larger yawning, empty holes under the Wall Street canopy, the former Woolworth’s building. 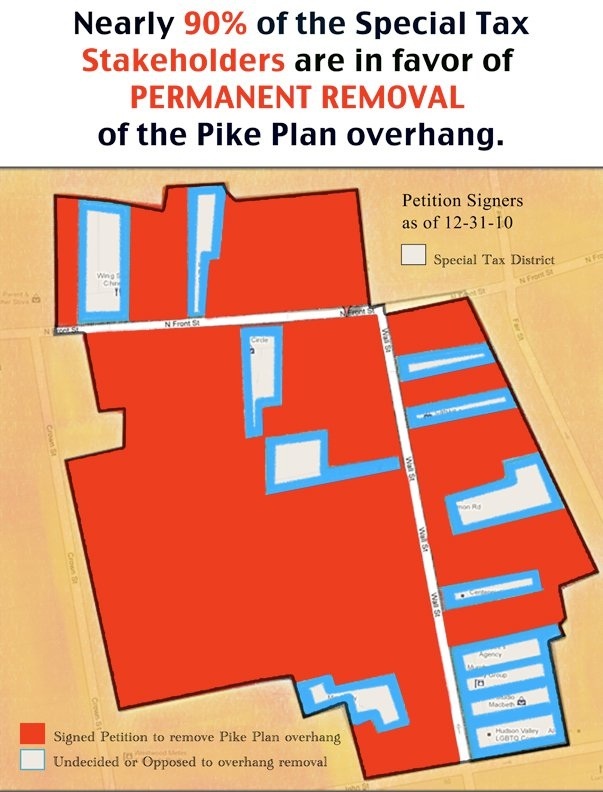 Spada has been reported as being in favor of ripping the Pike Plan down, and had promised at least one of the insurgents he would be there to lend his support, until he realized he had a doctor’s appointment. His presence would certainly have bolstered their argument in the face of a united front of officialdom. The two-story Woolworth’s property, blessed with a large off-street parking lot in the back, has also been rumored as a site for relocating a number of county offices. The detractors, however, maintain that Hastings’ continued presence on the commission alone is enough to render it illegal. In addition, they say, having an architect on the commission who is being paid to design the project renders that position effectively empty as well, with no architect even pretending to act in the interest of property owners. Hoffay had done his best to ward off an insurrection by reporting on the status of a request by Vanacore and others for more equitable representation by property owners on the Pike Plan Commission. He said the original state statute as adopted by the city calls for all seven commission members to be appointed by the mayor, and that the Common Council is in the process of amending local law to provide for elections for four of the seven, to come from the ranks of building owners. He said, however, that no matter what, the commission will remain in its current state until attrition requires an election, and that the mayor in fact would retain the right to reappoint any one of the existing commissioners for one additional two-year term, which would give Mr. Hastings at least one more crack at completing his dream project. No shrinking violet, Hoffay managed to re-convey his message while answering Hoyt’s list of concerns. “You’ve said a lot of things, and I want to address the process issue. Because I came late to this process. This started five years ago; I came on as an alderman less than a year ago, so I sort of walked into the project. And it took me a while to catch up with where they were in the process. I think the first thing that it took me a while to understand, because as a resident of Kingston, when Jen Ringwood was the alderman here, I was always pushing her, saying, ‘How come we’re not doing this? How come we’re not doing that?’ And she’s like, ‘The process is very slow, this has got to be done, that has got to be done.’ It has been a complex, complicated process. And it’s complicated for a number of reasons, one of which is the funding sources that are being used. This is not a straight-out, one-shot funding source, and we have to go by the calendars of the different sources. The biggest part of the grant, the part that’s actually going to pay for the construction of this, is the grant that Congressman Hinchey was able to secure for us, and it’s not just between the congressman’s office, or us, or the city; it’s going through the New York State DOT. So every one of those regulations become a hoop that the commission has to jump through. “And in addition, as you know, Rural Ulster Preservation has got a $200,000 grant that they have dealt with the state on. And they have had to renew that and hold that for us. Against a lot of pressure to let that grant go, they have held on to that for us, because of our commitment to the process. So I think it’s fair probably to look at this and say, ‘Well, you guys were very funding-oriented’ during the process. And that’s what I get from it. “These guys became very technical-minded, very much looking at these funding sources — ‘Can we get that approval? Can we hold onto it? Can we meet this objective?’ They did have, however, from everything that I’ve been able to reconstruct from talking with Kevin O’Connor, who is really very important to the beginning of this process, to Sue [Cahill] and others, and I was at, already during the last year, now two public hearings on it — they have had a number of public sessions right from the very get-go when Norman Mintz was brought in. RUPCO essentially paid for that, and got that whole process started. Hoyt pressed the point further in the meeting. “Was there any exploration as to the availability of grants to remove the arcade?” he asked. “No,” said Cahill, the city planner. Hoyt and Teri Rossin both reiterated that they had been told early on that tearing down the canopy was not an option for historic reasons, that it was a protected structure. Just my two cents. When I first visited Kingston’s Uptown I thought the canopy was charming. I had no idea it wasn’t historically correct. But is the plan to make the area a historically correct Disneyland? You can go too far with that too, which era do we pick? Most of all when it is snowing, raining or blasting hot sun, its just a very practical device for shoppers. I can’t imagine many of the business owners (not building owners) really want to discourage strolling. I think the canopy ties the whole shopping area together, I tend to not stray beyond it. Thanks for writing in, Deborah. Gathering more information currently about the history of the Pike Plan for readers that will be helpful. There seems to be very little discussion of the concept of a good canopy, one that provides some shelter and of course has to be built well. If this is truly an impossible thing to do, to build canopies that do not disintegrate if they are let outside, well, that has to be faced up to. It really is hard to believe that a canopy eludes modern construction and technology to make one with a 30-year life (just how much life was expected? Can there be a plan where the canopies can be built and maintained such that the businesses within can be expressed on the canopies themselves? and would the businesses find that worthwhile? So first, is there a canopy that could work…. live in the weather, be attractive and useful to the businesses, If no, then down then go. Nothing much more to be said. I assume that all the value to the canopies is meaured directily by the revenue and customer traffice brought to uptown, including the pleasure of the working people, the office staff, etc. If there is such a canopy, is it possible? 1) is there a solid guarantee the thing would work. So far, we’ve got two back to back failures, so it’s not looking good. 2) is it affordable. If it could be built, if it is affordable, and if it could be done such that the businesses withing can reflect their identity on the outside, then there’s a plan. Anyone want that plan? Will a plan to take the whole thing down be more successful in the execution than putting it up. I hope so. there is going to be a lot of work to get everything put back in place. Gonna mess with the sidewalks and the planters and the bump outs? One thing removing the canopy would do: it would not force the businesses to proceed in lock step year after year, presenting one front to businesses behind them that have good times, bad times: Let the buildings, like they are in every other town, be gussied up and some be in some state of disrepair and care, side by side, rise and fall… and leave the problem of the neighborhood to the business neighborhood. Anyway, this presentation resurrected and distributed so competently by Kingston Citizens is most welcome: Great job there and a document worthy of have been re-presented. I never had a clue it existed, never saw it, nothing even vaguely as detailed. Great job then. Good luck with the next step. It is a very good thing to have KIngston Citizens involved… masters of civil and civic-minded communication! Thanks, Gerald! Working on a post to share more information from that time period (2008/09/10ish). Hoping it can help to inform the community as it takes this up to decide….again.